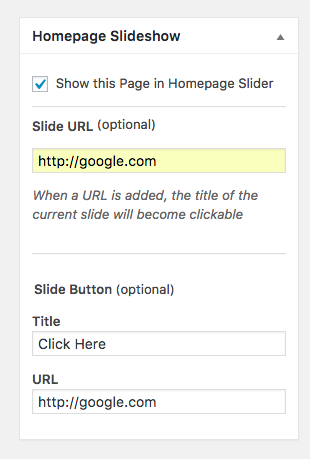 Slideshow Size – 947x500px (default 2/3 size), 1270x500px (at the top). 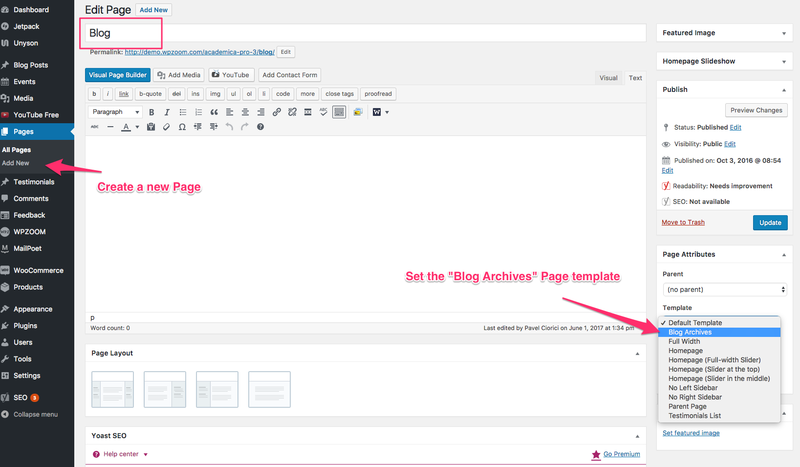 Page Templates – Blog Archives, Full Width, List of Pages, No Left Sidebar, No Right Sidebar, Testimonials. We’ve written for you a checklist with things to check after upgrading the theme from an older version. 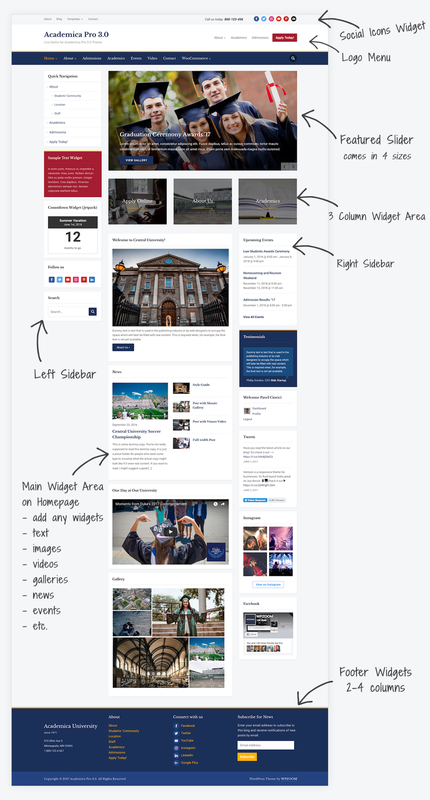 To get the same layout as in the following screenshot from the demo, you have to create a new static page and set one of the 4 available Homepage page templates, and then set this page as your front page. Unyson Page Builder – a free plugin that includes a Page Builder extensions, which you can use to create different page layouts. The Events Calendar – a free calendar plugin to create a page with Events. Sidebar Login – free & simple login widget to add in the sidebar. 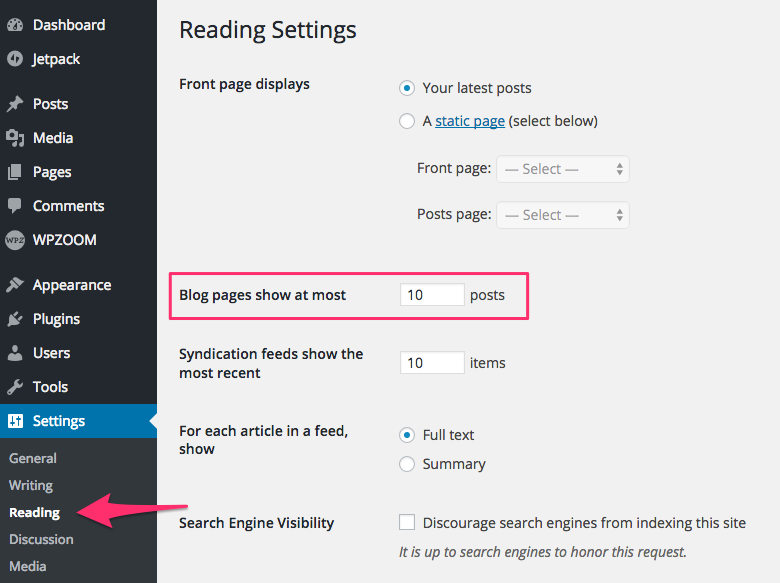 Go to plugin settings from SEO > Search Appearance, and under the Breadcrumbs tab you can enable this feature. You can create a Video page like this one from the demo using the free YouTube plugin. 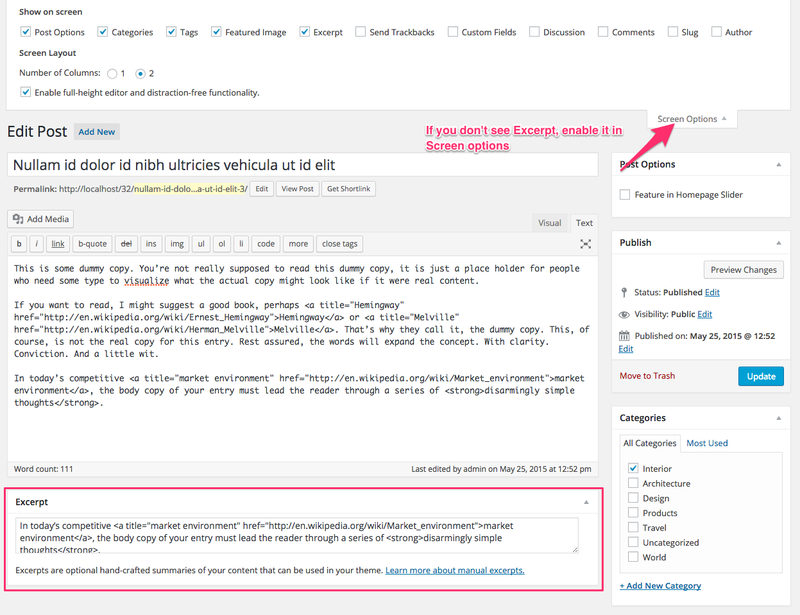 You can configure each widget individually on which page it appears by using the Widget Visibility feature from Jetpack plugin or a different Custom Sidebars plugin. Social Icons in the footer can be added using Social Icons widget (free plugin created by WPZOOM). Once you install the plugin, activate it, go to Widgets page, and add the Social Icons by WPZOOM widget to the Header Social Icons widget area. 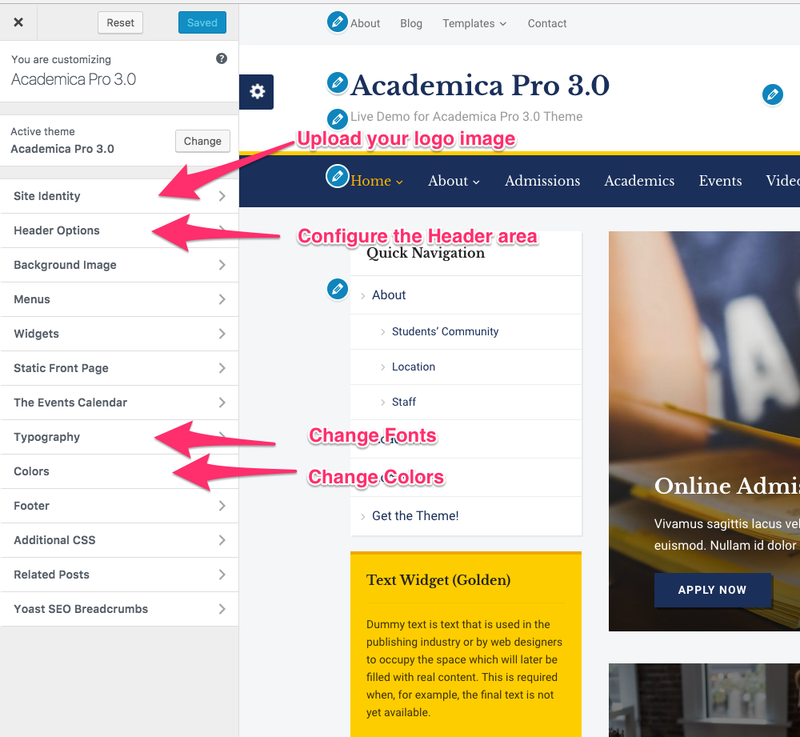 In Academica Pro 3.0 many options can be changed and customized from Theme Customizer. 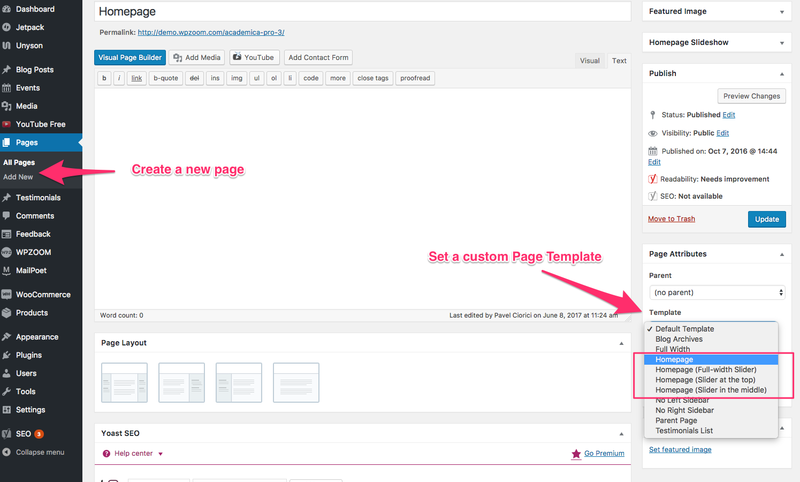 You can access the Customizer from Themes Page. 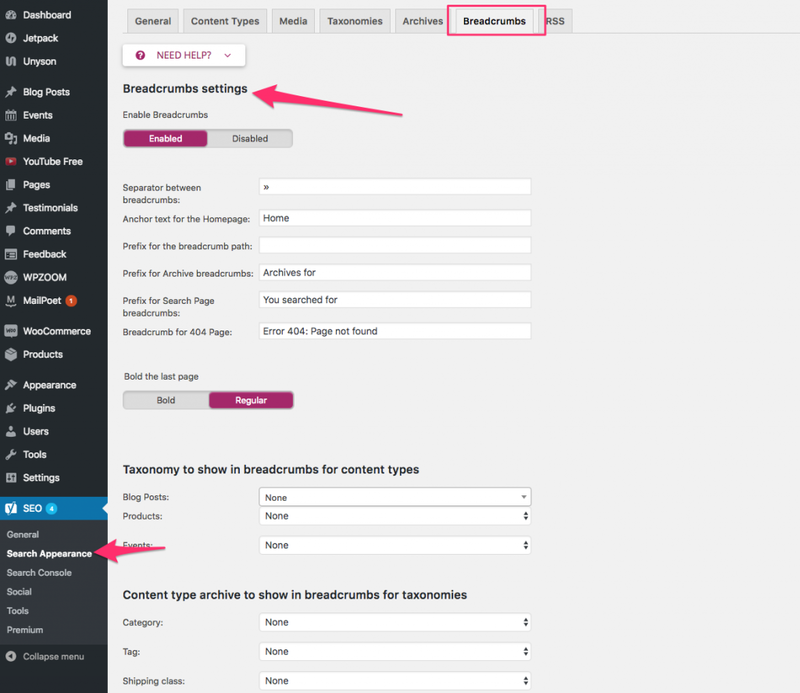 In Header Options you can select to hide the search icon or a specific menu. and then set it as you Front Page in Settings > Reading. 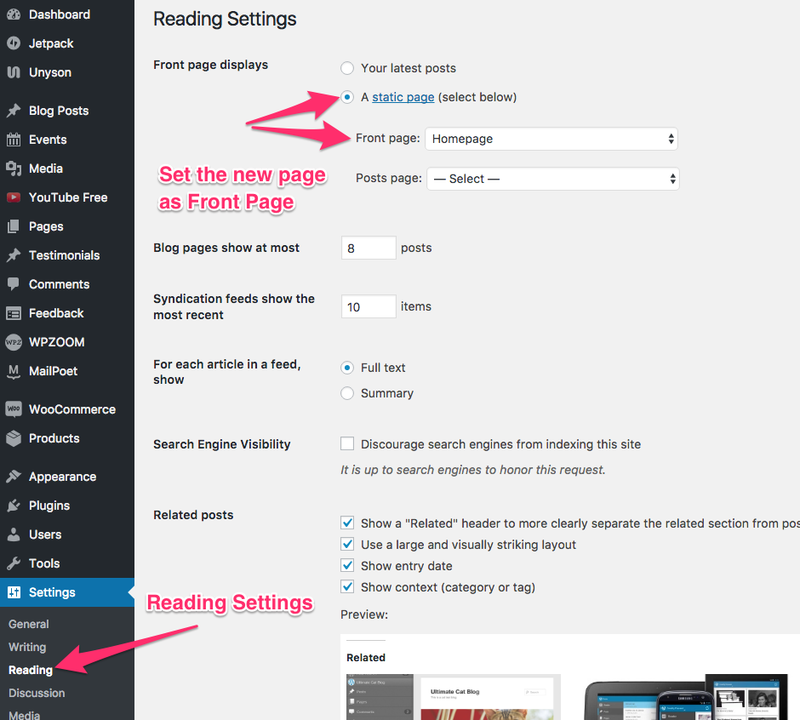 The middle column from the front page is the Homepage: Content Widgets area. 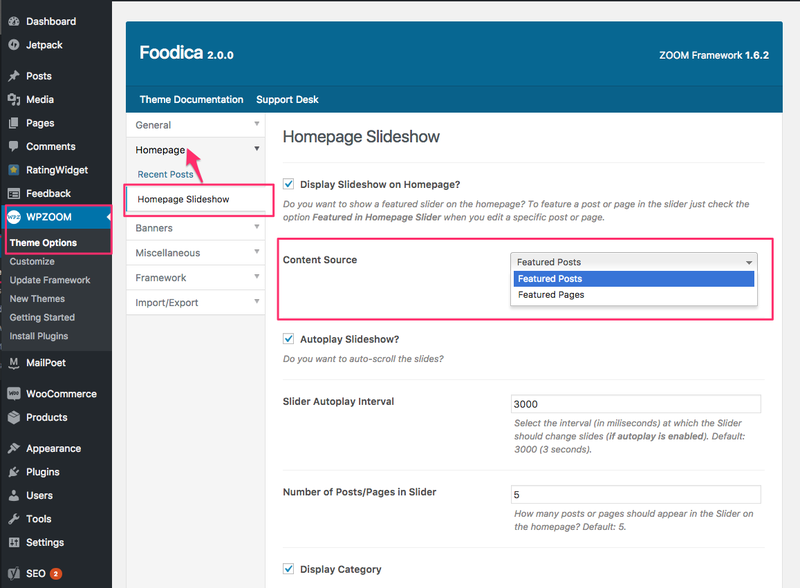 To add a new post or page in the slider on the homepage, edit the post/page you want to feature and check the Show in Homepage Slider option. 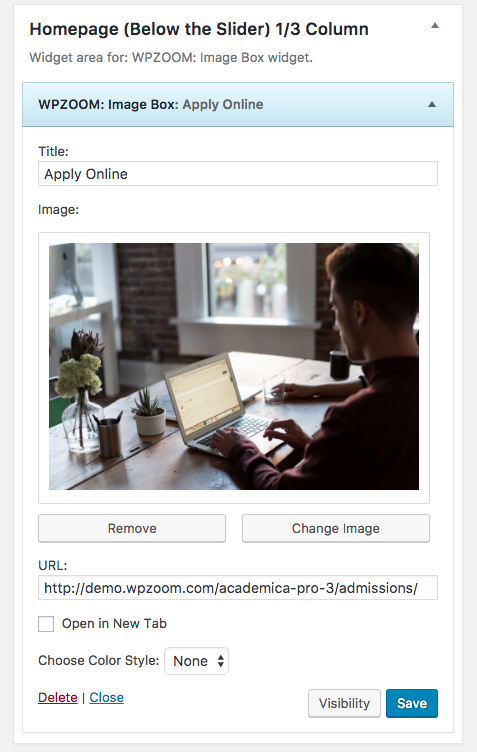 Academica Pro 3.0 includes a new useful widget called WPZOOM: Image Box. This is a simple widget that allows you to upload an image and link to different pages from your site or to external sites. The widget can be placed in the 3 widget areas below the Featured Slider on homepage or in other widget areas like Sidebar. Starting with Academica Pro 3.0 you can control what menu is displayed on mobile devices. 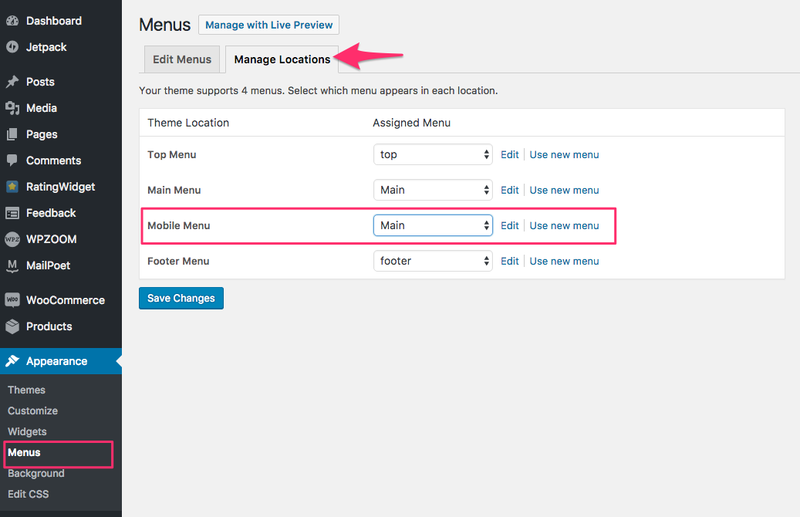 All you have to do is to go to the Menus page, create a new menu or assign an existing one to the Mobile Menu location. 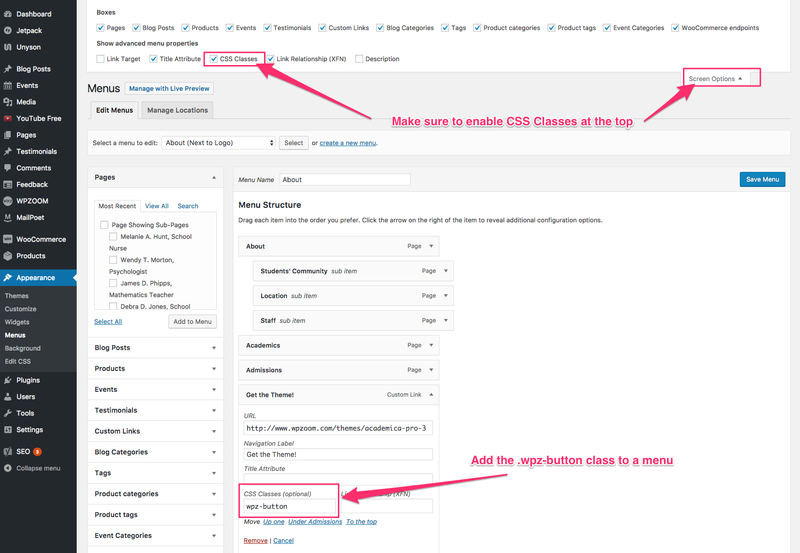 If you don’t see the CSS Class field, just enable it from the Screen Options button in the top-right area.